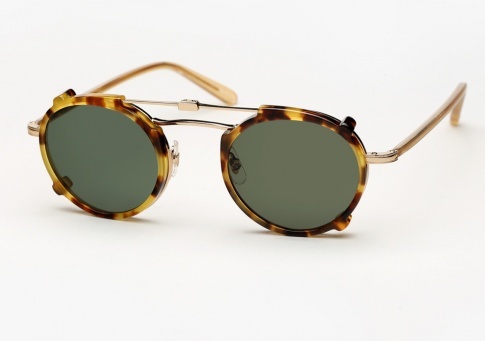 Garrett Leight Penmar - Gold / Blonde + Clip (Eye) Need Help? The GLCO Penmar is a classic round style with great proportions. The unisex design features detailed metal filigree, a unique curving bridge, and comes complete with Garrett Leight's signature metal foldable clip-on lenses, allowing it to worn as a sunglass or eyeglass. It is offered here in a rich combination of gold with "Blonde" acetate temples, paired with clip on lenses in gold / "Sunflower" tortoise.